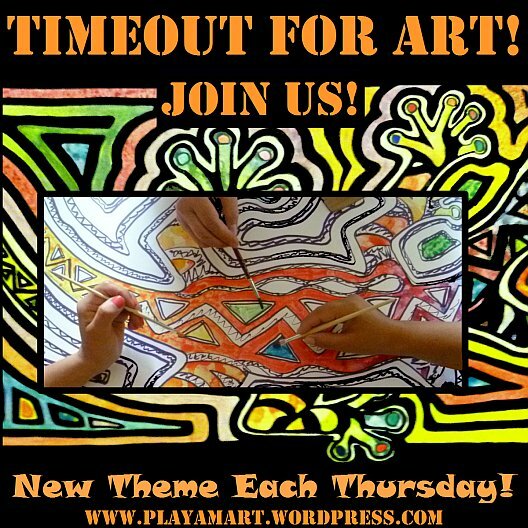 Enjoy the runaway colors arranged with respect to a color wheel! Called “Malinche” in Costa Rica, this is also called Royal Poinciana. Manzana de Agua or Water Apple has a puff of a blossom! Its delicate fruits are like a cross between an apple and a pear. 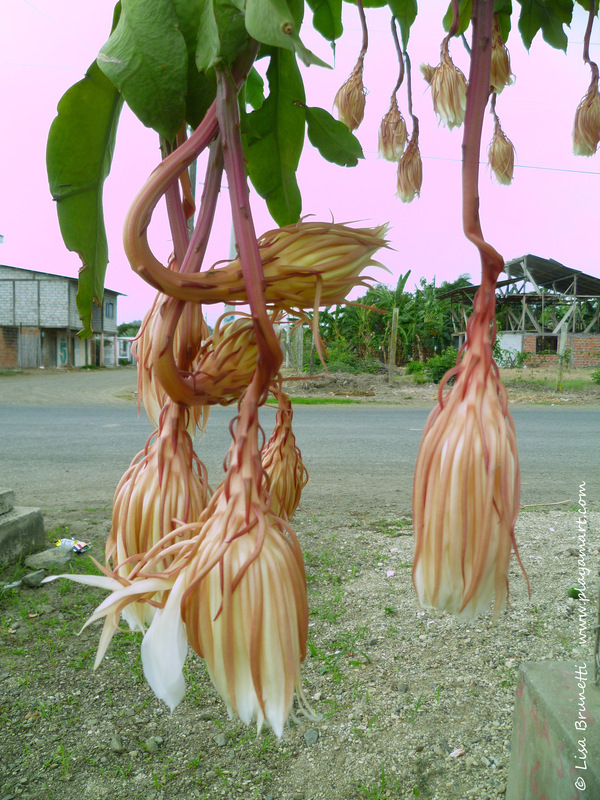 Lovingly called “Coralito” in Ecuador, this prolific climber graces many fences in the country. 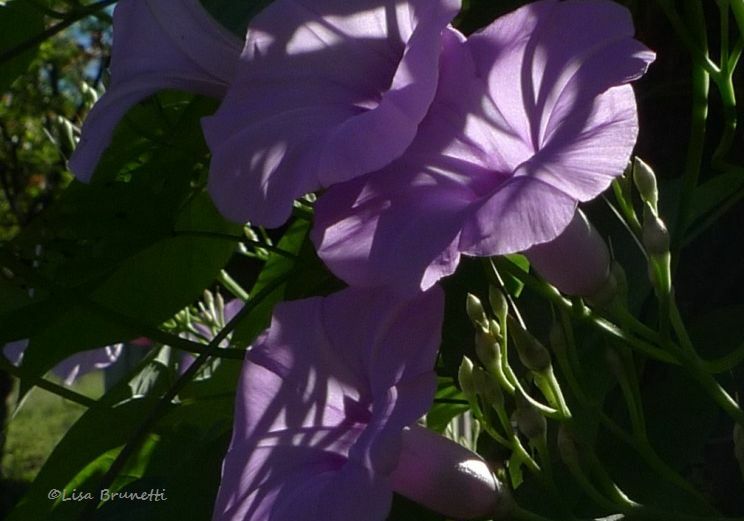 Weaning into the purples and blues, the lowly morning glory smiles in the early-morning sunlight! A vine that grows stretches to the treetops in the dry rain forest, this transplant was quite happy to be upgraded to garden status! 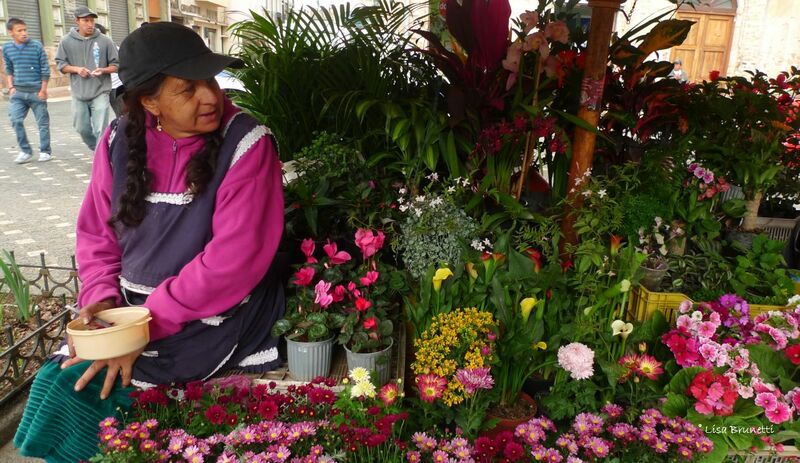 From the coastal Pacific to the Highlands of Cuenca Ecuador, the bright colors of flowers brighten the scene. Back to the Coast, we soften to pastels of the exotics. I hope you enjoyed these high-spirited flowers that were quite impatient to say, “Howdy” to the world! 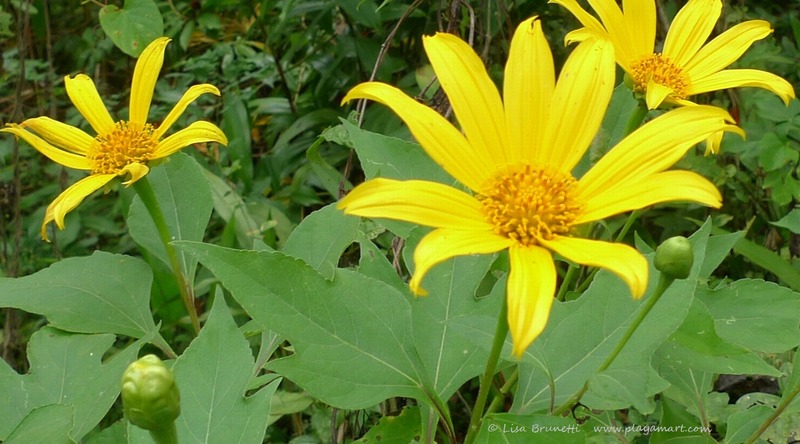 Please visit the Let’s Be Wild page and enjoy images of flowers from all over the world! I cleaned it up a bit and let it have its way! the latin men are very patient teachers.. they love to dance and love to teach the novice… in half an hour you’d be twirling and dancing your heart out! you are so right! ja ja HA! Alamanda widespread in Florida, cheerful color and quick grow and thrives dry and hot weather too. But esp for children don’t play around with that milky white sap or rub flowers and on skin – poisonous esp eyes will explode. Oleander too. 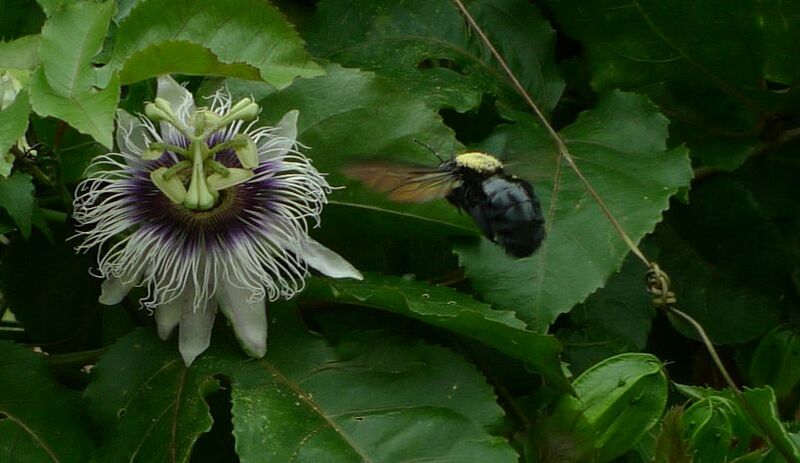 Passion flower seems like a being from another planet. Wow! I knew that about oleander, but not about Alamanda.. Although when I see milky sap, I treat the plant with caution. Plumeria (which I had intended to include!) probably has a sap that will bite. Thanks so much for the advice about Alamanda! it’s quite amazing to watch the path of the sun throughout the year.. where you mark it in march, it will keep rolling north til june.. stop on the solstice, then start back in the other direction.. in september, the sun should be on the same spot it was in march. you’re going to have so much fun exploring your new place! it’s raining cats and dogs and pelicans and egrets. i’d best shut down the computer! WOW some BEAUTIFUL exotic flowers to brighten up our CHILLY WISCONSIN DAY!! When I endured the winter months in Mississippi (you laugh?) I went to the florist’s about every ten days and asked permission to look in their cooler. I would select a stem of ‘this’ and a stem of ‘that’ and went home with flowers for the house, for painting, etc. I put nosegays here and there, and they really helped brighten those winter months! You should do the same! We are just starting to see buds on the trees and some of my perennials are starting to pop up out of the ground, won’t be long now. At least you had a bit of a reprise from the rain, hopefully this time it won’t last too long. ha! you’ll have some lovely springtime flowers in another month! hopefully these will hold you until that happens! April?!!!!! oh my! i’ll have to send you more photos of flowers in another month! I was thinking of doing that flower challenge to keep me thinking of spring. that should be fun! thanks! you seem to manage quite well during the winter, and then you have those long long days of summer! So many beautiful pictures, Lisa. And when I look at them and the richness of flowers they depict I certainly understand why people are drawn to the tropics and the sub-tropics. The nature is wild! Thank you for sharing of the richness. thanks! it’s so great to go into the gardens in the early morning when the sun and shadows are so ‘new’ – there’s so much to see, appreciate each day… young iguanas all but camouflaged against the foliage; chunky skinks prowling at ground level; butterflies and more butterflies! the birds aren’t very skittish – once i came back from the beach with a cicada in my hand, and when it started making that raucous sound, the magpie jays came flying from all directions! an orinthologist observed that the vultures weren’t scared of man the way they are in the states – because no one is taking pot shots at them with a gun! yes, it’s visual overload when one steps out the door! 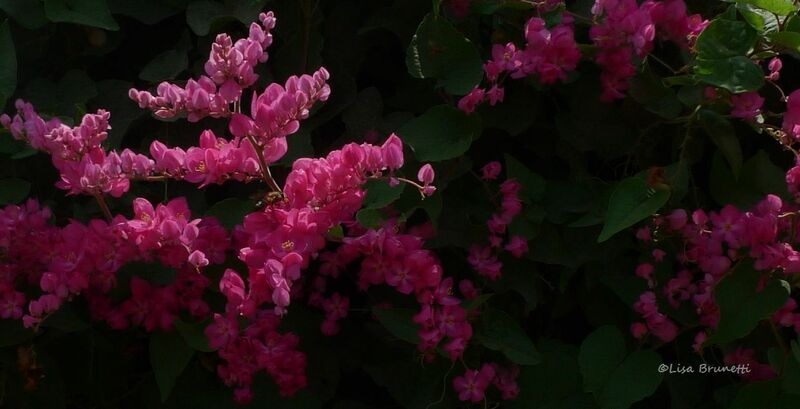 What beautiful flowers… no wonder they were impatient to get to the world. A truly colorful way to start my day. Thank you very much for this! Beautiful flowers! I can’t wait for spring now – we have waaaaaay too much snow at our place. ah! springtime! dogwood and wisteria and tulips and narcissus! we have exotics, but i still miss the flowers of springtime! hopefully these will hold you until you have your own visual overload of flowers! oh my!! such loveliness!! and so many interesting blossoms, so many I’ve never seen before. photo after photo of unknown blooms, unknown to me that is. thank you so much for sharing. I too love flowers, perhaps I’ll do that challenge as well. never heard of this one! i’m glad that you en joyed seeing many new flowers! after looking at so many, i realized that i am ready to do a few studies of flowers.. presently a big contemporary painting is consuming my time, but it’s going well! ah, so that’s where you’ve been. oh yes, a study of flowers would be great! I would definitely love to see them. I am loving your flower show. The morning glory was the highlight for me. i’ve loved that morning glory photo as well.. they were blooming on the side of the road on a friend’s property.. so lovely that morning! My grandmother had passion flowers in her yard in St. Louis, MO. I looked it up and apparently there are many species of passion flower, some adapted to cold climates. 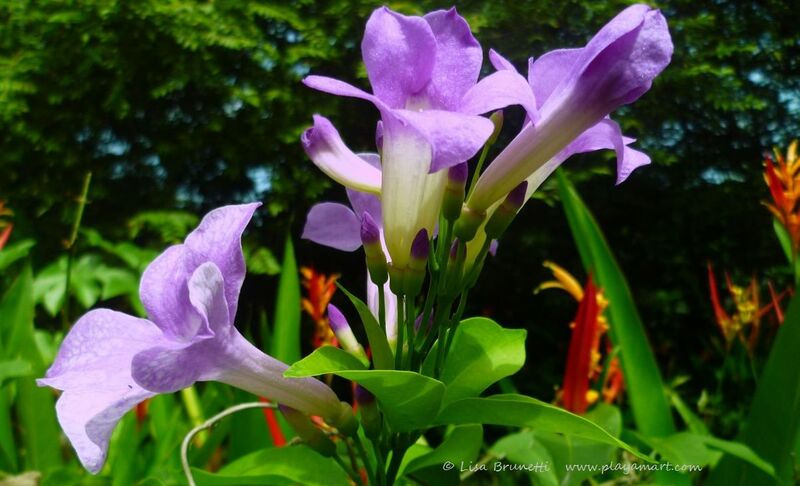 I always thought of them as tropical flowers and wondered how they ended up in my grandmother’s yard! i remember seeing small delicate passion flowers growing wild along the ditches in mississippi. an older mentor told me that his mother called them may pops, because when you stomped on the fruits, they popped! now that i live where the mammoth varieties are grown for the tart, fragrant fruit, i wonder if those little maypops had a similar filling! i’ll bet your grandmother’s yard was magical! Yes, that yard was magical. I spent several years fussing around trying to duplicate it. Came close, but her touch was magical. Lovely! It was like attending a flower show. Love your descriptions. thank you! aren’t flower shows wonderful? my favorite was an orchid show that i attended with a friend in panama. Oh the orchids!!! Hiking along the Inca Trail to Macchu Pichu, the orchids highlighted the trail for miles and miles. Incredible. WOW!! As I have said before, you live in a beautiful place — in so many ways. i was just comparing notes with someone about the absence of mosuitoes in tropical america vs clouds of mosquitoes in the usa! yes, we have mosquitoes, and they carry dengue and malaria, but one can sit on the deck or outside all day and/or night and rarely get bitten. the hours of sunrise and of sunset are the times they are worst, but still nothing like they are in the usa! the manzana de agua grows to become a very large tree! its lower braches would eventually cover the entire footprint of your house!!! maracuya grows like the weed that it is! lovely weed, oh so lovely! Lovely flowers! I like the third to the last – how unusual! flowers are very important to me.. i like to have something smiling at me when i get home! thanks! yes those pastel colors are soothing. Fabulous shots all Lisa! But especially the Maracuya – the only one of the lot that does not grow here. I love all the tropical flowers so varied in their form and shapes. some of your floral images linger in my mind’s eye. it would be great to set up and do some watercolor studies in your gardens! Those are gorgeous! I’m also happy to put names with some I’ve seen here but didn’t know what they were. i’m delighted to be able to help you with flower identification! gracias! Gorgeous flowers zee. I’ve never seen the Water Apple flower or tasted its fruit. 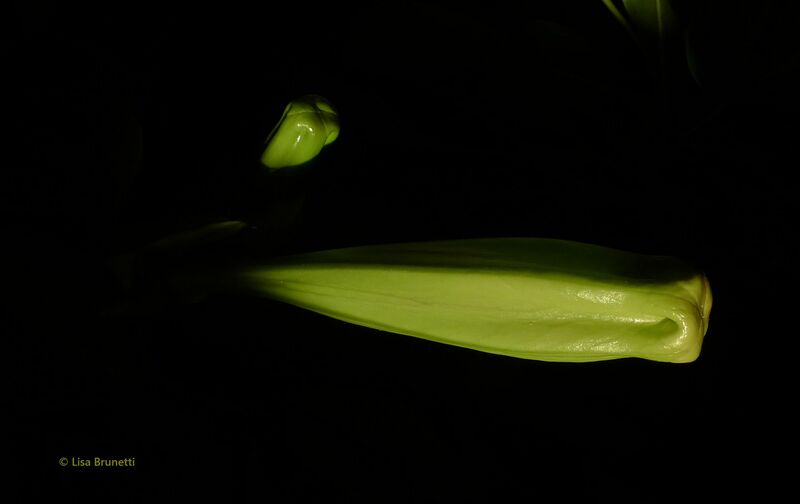 When I saw the photo of the night blooming cereus flowers I went WOW. It’s enormous. I’ll take your word for it, as I’ve never seen it in northern latitudes where it’s smaller. The water apple is quite small, compared to an apple or pear, but they are so delicate with an equally-delicate aroma! They are all beautiful! The passionflower is often sold as potplant here in Sweden. I love them, but they are difficult to “reflower”. Fantastic structure of the flower. You are lucky to have it all! There’s certainly nothing understated about these flowers!! What vibrant colours!! thanks! the tropics certainly produce some stunning colors! thank you! flowers are important to many of us, and you’re in that group for sure! Love the Water Apple blossom, pastels of the exotic (my favorite!) 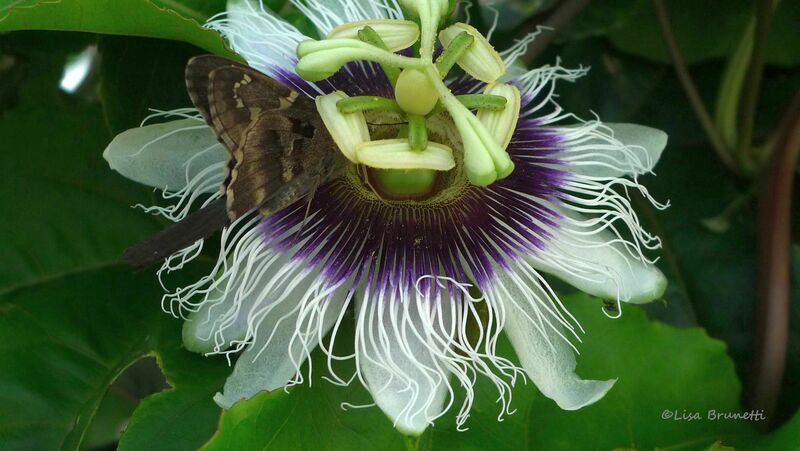 and the passionflower. So many beautiful flowers there!